Time to grab your gear, your grub, and the beverage of your choice as the Pittsburgh Steelers and the Arizona Cardinals go head to head at Super Bowl XLIII. We know many of you are looking forward to the game, and we've got some online destinations to make 2009's contest the best Super Bowl ever. Esquire: The top 5 banned Super Bowl ads of all time, including last year's GoDaddy ad featuring Danica Patrick and PETA's recently banned Veggie Love ad. GoDaddy: The domain merchant is already showing two 2009 Super Bowl ads on its home page. Go check them out. CBS: Vote for your favorite commercial on CBS' The Greatest Super Bowl Ads, then come back on Saturday, January 31 to vote on the top three. SuperBowl-ads.com: Check out the best collection of Super Bowl ads on the web. Money The economy is in a slump, and The New York Times says the corporate barons aren't taking their corporate jets to the game like they did last year. Superstitious investors will also be keeping an eye on the Super-Bowl Indicator for signs of economic recovery. If the stock market is not your game, there's always sports betting. Ogpaper.com: A list of favorite Super Bowl betting sites worldwide. BetUS.com: A dedicated page to Super Bowl betting action. Twitter: Keep an eye on the behind the scenes action with @Super Bowl on Twitter. Facebook: Here you can log onto the Pittsburgh Steelers Fan page or the Arizona Cardinals Fan page where both teams offer Facebook apps that let you virtually rally for your team and "smack talk" the other. Party Planners: Check out the numerous party planner online including party411.com, About.com, Esquire's Everything Guide to Super Bowl XLIII and Food Network's Big Game Bash. 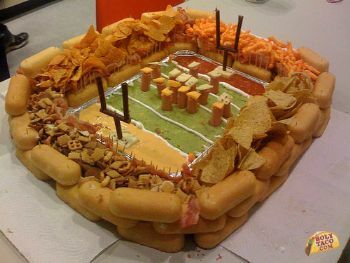 You could also try making a Taco stadium (see image above), but don't blame us if no one eats it. NFL.com: -If you can't believe your favorite team is out of this year's big game, use NFL.com's Replay Re-cutter to make a highlight reel you can live with. That's it! Game time is less than two days away. We hope these tools and tips will enhance your Super Bowl experience for 2009.